It has been a labour of love, a 25-year labour of love. Many years ago I sat on the schoolbench at navigation college in Iceland, along with a bunch of other aspiring ship’s officers. The curriculum was broad, to say the least. As well as navigation, chartwork, stability, maritime law, meteorology and all the rest of it, English and Icelandic were required subjects. So was Danish, but we’ll gloss over that. Among the required reading was a book called Pelastikk. It means Bowline. You know, that fiendish knot that every scout or seaman should be able to tie with his eyes closed, the one with the snake coming out of the hole, around the tree and back down the hole to produce an eye that won’t slip. This was a novel with a nautical slant and although I wasn’t reading much Icelandic stuff back then, this one caught my imagination and I read it at a single sitting. It had been written by a local author called Guðlaugur Arason, known as to everyone as Gulli Ara and something of a legend as the author of several books that shocked and surprised when they were published in the 1970s and 80s, as well as having been a fisherman since he was a boy. He had even been a student at the same college in Dalvík a few years before me. Pelastikk tells the story of a precocious eight-year old boy at the tail-end of the 1950s who gets the opportunity to spend the summer at sea with the crew of a Dalvík herring boat. It paints a picture of a world that disappeared not long afterwards. In the 1950s the herring boats were small. These were 80-90 foot wooden boats that sailed with a crew of a dozen or more men following the migrating herring eastwards along the north of Iceland until the shoals took a turn southwards, providing Iceland’s eastern fishing villages with booming economies while the fish were there. As winter approached, the fish would disappear into deeper water and the following spring it would all start again. The year after Gulli’s book was set, the first power blocks appeared and the old-fashioned purse boats started to disappear. (Apologies for the technical stuff, but it’s part of the tale). In 1968 the herring disappeared and a way of life went with them. The reasons are still not entirely understood, but a combination of heavy fishing, climatic change and natural fluctuations of pelagic stocks are all part of the mix. It was catastrophic for Iceland, which saw hard times and large-scale emigration in the following years. But things improved and stabilised. Fishing shifted to groundfish and the fleet went from purse seining to trawling and longlining. Gulli Ara’s book is a vivid portrait of the herring years when work was plentiful and a season on the herring could put enough in their pockets for a young couple to buy their first flat. Icelanders of a certain age still talk wistfully of the herring years, while those of my age look back at the shrimp years when there was a boom in catching the little pink beasties. That came to an end as well, due to falling prices and rising fuel costs, but that’s another story. Anyhow, I picked up Pelastikk all those years ago and started translating it, purely for my own amusement, a couple of pages every night, with a pile of paper that grew on the living room table next to a rattling manual typewriter. Yes, it was that long ago. One day I looked Gulli up in the phone book, gave him a call and asked if he minded if I tried to find a publisher. Mind? Of course he didn’t. In the meantime I had moved back to England and in between working at sea myself and trying to find my feet as a jobbing hack, I re-typed the manuscript of Pelastikk into a shiny new Amstrad. Pelastikk had been a hugely popular book in Iceland and was even a set text for years in schools and colleges. English-language publishers weren’t interested. Some were polite. Others were snooty to the point of being downright offensive. One specialist small press showed an interest, but with Arts Council funding slashed, simply couldn’t afford it. It went nowhere and while Gulli and I kept in touch, the English manuscript of Pelastikk, now renamed Bowline moved from one hard drive to another every time I upgraded to a new computer. The last time this happened I gave Gulli a call and suggested that it was maybe time to go down the self-publishing route, explaining what a Kindle is. I had to edit the whole thing again, making it less stilted. My original translation had been extremely close to the original text – too close, if the truth be told. So in places sentences have been melded together, idioms have been replicated as faithfully as possible and the untranslatable jokes have been spun around or replaced with something that fits the bill. Translation is very different from writing your own stuff, calling for a different set of skills that include an element of creativity, while also remaining as faithful to the original as is practical. There is so much that that does not translate well directly and a translator has to be able to interpret as well as translate, but without slipping into the pitfall of ‘improving’ on the original text. A translator is not an editor, but occasionally you have to ask yourself if you need to be thinking of your readers or of the author’s original text, and treading a path between the two isn’t always easy. So with the text tweaked and polished, I navigated the surprisingly straightforward process of formatting and uploading, and we were ready to go. 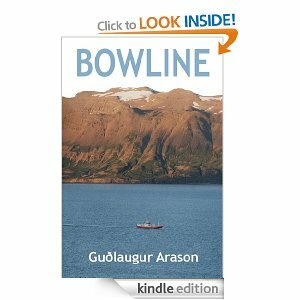 So Guðlaugur Arason’s Bowline is now available at long last in its English translation on Amazon here (UK), here (US) and here (Germany) for anyone who has a Kindle or an iPad. It has taken more than twenty years since I started tapping out the translation on that battered typewriter and in spite of the attempts, I suppose I knew that it would never be likely to find a place on even an obscure publisher’s list. So it’s a huge satisfaction to see it at last available for the niche market of readers who take an interest in Icelandic fiction and fishy stuff. Originally published in 1980 when there were still clear memories of boats queuing to land their fish at the height of the season and the anxiety as the herring made themselves scarce at the end of the 960s, Bowline is unique in providing an account of Iceland during the bustling, smelly, colourful herring years written as fiction. Or is it fiction? I did ask Gulli how much of this really happened. He wouldn’t be drawn. But my guess is that much all of it’s real, even the part about the giant farmer’s boy on Grímsey who knocked out his great-grandmother’s teeth with a hay rake. 2nd Outing for Sergeant Gunnhildur in this riveting Icelandic murder investigation.